A letter written by George Godwin discussing daily activities with the Cheshire Yeomanry was published by Chester Chronicle on Saturday, 26 September 1914. At the time the Cheshire Yeomanry were encamped at Kirby Cane Hall, near Lowestoft in Norfolk, on home defence duties. John Godwin was an employer and textile designer; he died in November 1911. Census information also identifies his sons Harry and John as textile designers. The 1911 Census shows Alfred as a clerk for a textile designer and George as a bank clerk for Parrs Bank. Harry married Dorothea Mary Woodhouse in 1912 and they had two children: John (b.1914) and Derek (b.1917). Alfred appears to have moved into farming; his mother, Elizabeth, was living at Ivy Farm, Macclesfield, in 1917 and in 1939 both Alfred and Elizabeth were living at Old Hall Farm, Rainow, Cheshire, where Alfred was a milk and poultry farmer. George enlisted with the Cheshire Yeomanry on 31 August 1914, and was discharged on 25 December 1914, being declared medically unfit for service. A Court of Inquiry held at Langley Park on 5 November 1914 found that he had sustained an accidental injury to the right knee while he was in the performance of military duty. The records for those awarded the Silver War Badge state that he had a re-current displacement of cartilage in his right knee. In 1928 he married Dorothy Bates and in 1939 the couple were living in Runcorn, where George was a Bank Inspector. He died in 1956, aged 71. In George’s letter about life with the Cheshire Yeomanry he refers to sharing a tent with a brother but does not mention him by name. It is unlikely to be Harry, who was aged 40 in 1914. Brothers John and Robert were living in the USA by this time. No service record has been identified for Alfred. The National Archives do however hold service records for Lieutenant Frederick Harold Godwin of the Cheshire Regiment. No review of these records has yet been completed to ascertain whether Frederick had any early service with the Cheshire Yeomanry. Robert Godwin, well known Fresno boy, was killed in action in the Haig drive against the Hindenburg line in Picardy, August 19, according to a letter just received here from H.P. Robinson, a friend of Godwin, who has since been killed in battle. Godwin is well known here having lived in Fresno for eight years during which time he was associated with his brother, John Godwin, at Wahtoke. He was 28 years old and a natvive of England where his parents reside. Whilst on a patrol in “No Man’s Land” in front of Fresnoy-les-Roye on the night of August 18th 1918, and when close to the German wire, he was instantly killed by an enemy rifle bullet. Owing to heavy fire, it was impossible to remove the body at the time, and a patrol sent out later was unsuccessful in locating same. 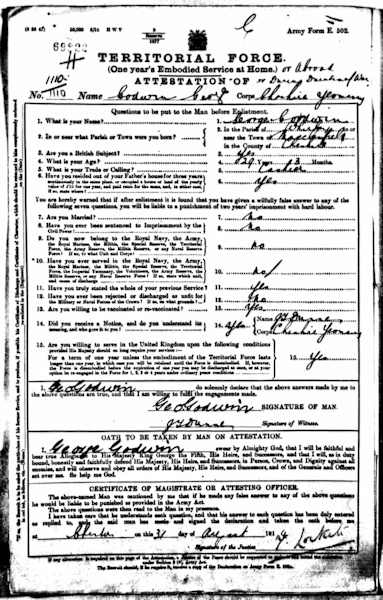 Private Robert Godwin (No. 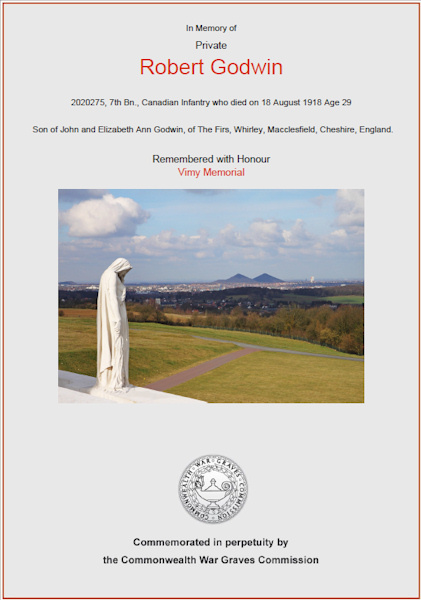 2020275) of the 7th Battalion Canadian Infantry is remembered at the Vimy Memorial. The Vimy Memorial overlooks the Douai Plain from the highest point of Vimy Ridge, about eight kilometres northeast of Arras.